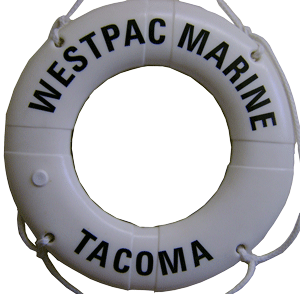 Westpac provides vinyl cut lettering for both 30" and 24" life ring buoys. The standard height of our lettering is 2" but we can easily make them in 1¾" or whatever your need happens to be. The USCG standard is for 2" block lettering. Black letters are our standard color, depending on quantity other colors are available. When you order place the vessel name and port along with life ring brand and size in the comment section of the order form (when you check out). We will confirm spelling with you prior to production. How to install your new lettering.